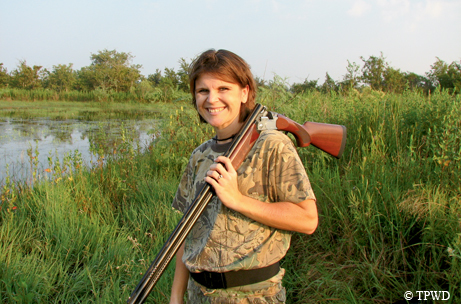 ﻿﻿﻿Female waterfowl hunters prepare for the hunt. ﻿﻿﻿﻿﻿﻿﻿﻿﻿﻿Increasingly, women are finding their way to waterfowl hunting. Perhaps it’s their innate yearning for time out in nature or a desire to procure the freshest, nature-raised meat for their family. Perhaps it’s the thrill of the hunt itself, with the added excitement of dogs and calls and disguise. In some cases, the path to a successful waterfowl hunt is made more daunting to women because they lack the mentoring needed to assist them in their preparation for the big day. By following these simple steps before waterfowl season, women can experience an enjoyable and successful hunt. The first step is education and licensing. Every hunter born on or after Sept. 2, 1971, must successfully complete a hunter education course and carry proof of certification while in the field. A hunting license and federal and state migratory bird hunting and conservation stamps (duck stamps) must also be purchased and carried with you while hunting. Licenses can be purchased across the state, at all TPWD law enforcement offices and at most stores where sporting goods are sold. The next step is gearing up. On your first visit, a large hunting department store can be intimidating, so let’s break down the process into manageable pieces. Weather will factor into your clothing choices. No matter where you hunt, it’s always beneficial to dress in layers. Since you’re hunting waterfowl, waterproof clothing is a must. Most hunting stores now offer clothing targeted specifically for women. You can find appropriate hat, pant and shirt sizes to match the camouflage pattern of your hunting location, whether in bottomland forests, marsh grasses, croplands or even snow. Good waders are crucial. Several brands offer sets that include chest-high wader bibs and jackets. Many coats are insulated for warmth and have removable outer shells or inner vests for layers of comfort. Having a well-fitted shotgun is critical to becoming a proficient shot. Many shotgun manufacturers now design their firearms specifically for the differences in a woman’s body frame. Knowledgeable staff at a reputable firearm dealer or hunting store can help you select the best gun for the hunt. They can help you determine the proper length of the stock and barrel for a good fit. After you purchase a firearm, visit a local gunsmith, who can ensure proper fit and modify the stock to match the contour of the shooter’s cheek. The type of ammunition you select depends on the size of the birds you’re hunting. The most commonly used shot sizes for waterfowl include (from smallest to largest) 4, 3, 2, 1, BB, BBB and T. The smaller shot sizes are recommended for ducks, while the larger ones are used for geese. Shells also come in varying lengths, including 2¾-inch, 3-inch and 3½-inch. Waterfowlers typically prefer 3- or 3½-inch loads that carry heavy shot charges for greater pattern density. U.S. law requires the use of nontoxic shot while hunting waterfowl. Match your firearm with the proper ammunition. Read the specific gauge designation that is stamped on the barrel of the shotgun. Match that designation exactly. For example, if the shotgun barrel is stamped “12-gauge for 2¾-inch shells,” then that is the exact ammunition to purchase. Carefully read the information on the lid of the ammunition box. Always check both the gauge and the shell length, and make sure those figures match the data on the barrel. Once you’re properly outfitted in the appropriate clothing (with the proper pattern of camouflage to match the environment) and have a well-fitted shotgun with the correct ammunition, let the practice begin. Seek out a local sporting clays range to sharpen your shooting skills. When you’re comfortable with your results, let the hunt begin!